"With all the new Professional Development in my district - PLCs, Danielson, Literacy training, etc. - CMP has helped me make sense of it all." "I enjoyed spending time with people who are committed to being better teachers. I learned how teaching music in this model develops complete and passionate musicians!" One paradox of master teaching is that it comes across as organic and easy, even though it is thoughtfully and carefully crafted. Similarly, this model for planning instruction seems quite simple and intuitive, but contains the possibility for infinitely complex and rich thinking. Comprehensive Musicianship through Performance (CMP) is a planning process which you can apply to any level and any type of music instruction. The process leads to a program of teaching and learning which emphasizes the interdependence of musical knowledge and musical performance. This model for planning instruction is not a curriculum but rather a means to start looking at the ensemble rehearsal as a learning laboratory. ​What are the benefits for me? The CMP process can assist you in selecting high quality music literature, planning effective rehearsals and concerts, clarifying your long range goals and short term objectives, developing new teaching strategies, and applying appropriate assessment of learning. In short, you will be a more effective teacher and experience a higher level of personal and professional satisfaction. ​What are the benefits for students? Students will be actively involved in the learning process as they become more musically independent. Learning experiences for students can be personalized to include roles such as performing, improvising, composing, conducting, and analyzing. ​I’m already overworked. How can I add something more? You are probably already incorporating many of the CMP components into your daily teaching. The CMP planning process is intended to help you clarify, intensify, and make the best possible use of your time and resources. ​Will concerts and performances suffer? Performance continues to be an outgrowth of your daily rehearsals. As students’ individual musicianship and understanding grows, the natural outcome is a quality performance. In addition, performances can take on new meaning as you and your students share musical insights with the audience. The Comprehensive Musicianship through Performance project (CMP) was initiated in Wisconsin in 1977 as a means of assisting teachers with the development of “performance with understanding” in school music programs. The project began with a group of respected music teachers from diverse school districts and a project steering committee which facilitated development. The teachers and steering committee developed and field-tested a process for planning and carrying out instruction in performing groups which has demonstrated that the school music performing group can be an effective way to develop lasting musical skills and concepts. Since 1977, thousands of music educators have been introduced to the CMP model and process through summer workshops, convention presentations, and school district in-service meetings. The CMP process continues to be refined as more study, application, and results are reviewed by the CMP project steering committee. Joint sponsorship by three state-level agencies has continued since 1977. In the CMP process, the performing group’s rehearsal is seen as a laboratory where students can develop an understanding of musical concepts such as expression, melody, rhythm, harmony, texture, timbre, and form by being involved in a variety of roles including performing, improvising, composing, transcribing, arranging, conducting, rehearsing, and analyzing music. The original need for the project was documented by the writing and research of many music educators, including among others, Charles Benner who concluded after a research project project in 1972 that “in order to have an impact on musical behavior, there must be a planned efforts by the teacher in rich the performing experience with additional kinds of musical understanding.” The need is even more critical today with the trend toward outcome-based education and the call for verification of the developmental nature of music learning. The CMP model was developed through a careful examination of the teaching and learning process in music performing groups. The learner and the music are essential to the CMP planning process. Though the five components of the model are equally important, planning instruction can begin at any of the points. 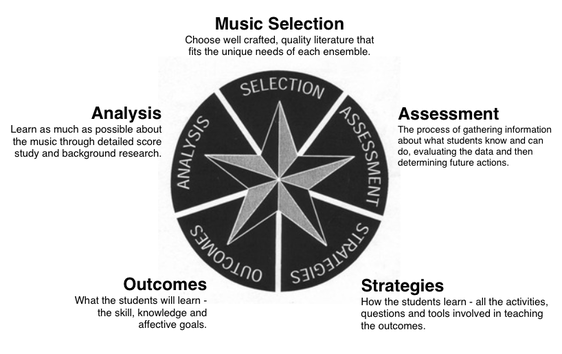 For instance, the selection of the music is often a starting point for planning but the decision about what music to use maybe based on an assessment of student needs before previous learning. Assessment is appropriate before, during, or after the process of study. A desired outcome may be identified through the assessment process or outcomes may be stated in a local curriculum guide. It then becomes the task of the teacher to select music which is appropriate for working toward that outcome. Analysis leads to recognition of those music elements that need to be learned to develop true “Comprehensive Musicianship through Performance” (or true understanding through performance). Strategies are the ways in which the teacher attempts to bring the music and the performer together so that quality performance and meaningful learning can take place simultaneously.